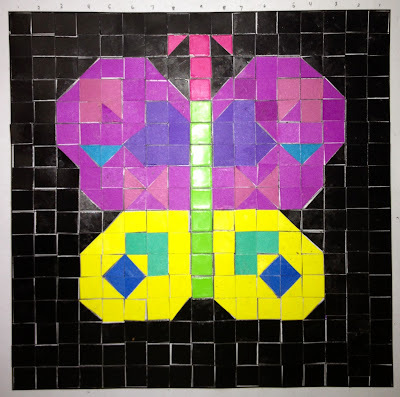 Project #1: Create a Classroom Mosaic Quilt as a Group or Class PBL - based on a particular theme (which can be set as a class or as groups of 4), where each class member contributes a finished mosaic. All the mosaics are joined together by tape (on the back) to make a complete quilt that can go on display! Is the group members contributing to one picture or are they making individual mosaics that can be joined together based on a theme? Is the final group/class design in the shape of a rectangle, square or a more creative and unique shape? Project #2: Commissioned Mosaic PBL - students form groups of 3-4 and decide on a target audience (such as the librarian, principal, computer lab, etc.) within the school. They come up with a unique and targeted design for that audience and approach them to see if they would like to "commission" a mosaic. As part of the "commissioned" experience, the group and the target audience will share ideas and come up with a more specific design. The group will take those ideas and through continued back and forth dialogue with target audience finalize the agreed design for the mosaic. The group will them create the mosaic and then present it to the target audience for display. PDF: Mosaic Tile Art Grid (for mosaic project) - print pdf in original size, no "page scaling" - you may want to use cardstock paper instead for durability. Also, you can join mosaic tile grids for the Commissioned Mosaic (a larger layout). INTERACTIVE PRACTICE: Create Your Own Pixel Art - as a planning activity for your individual mosaic quilt, design your mosaic art pattern using pixels. Make a frame that is 20 pixels by 20 pixels (to match the relative size of this mosaic quilt project). Practice making your own design inside that box, as practice for the project above you will be making. Below are two quick samples of pixel art I quickly made on this site. Click on it to see about what it would look like if done close to the size of the mosaic art.